SBI SME Recruitment 2019 Notification will be released soon. Apply Online for Special Management Executive (SME) Jobs in State Bank of India. Get complete details of SBI Special Management Executive Recruitment 2019 such as Eligibility, SBI Vacancy, Selection process, Exam Date, Application fee payment & process, etc. in the following sections. Also, obtain State Bank Special Management Executive Online Application link on this page. Visit www.sbi.co.in for any other issues. 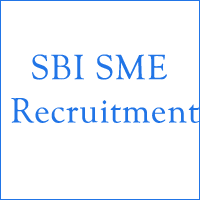 1.7 How to Apply online for SBI SME Recruitment 2019? In these days, the lacks of aspirants are competing for Bank Jobs. Those who are hardly trying for SBI Jobs, here is another opportunity for you. We all know that the State Bank of India presents many opportunities for recent graduates as well as experienced professionals for stimulated career growth. The candidates who have done CAs, ICWA, ACS, MBA, MMS, PGDBA, PGPM, PGDM from a recognized institute must grab this golden opportunity. One should clearly read the notification before applying for these SBI SME Jobs 2019. The Online Applications of SBI Management Executive Recruitment 2019 have already started. The State Bank of India SME Online Application will be available within the stipulated time. That means one can apply for these SBI SME posts up to the last date. State Bank of India (SBI) has recently released a notification for recruiting Special Management Executives or SMEs (Banking) at various branches of State Bank of India. So, as per the latest news, it has released a notification on its official site, i.e., www.sbi.co.in for filling the vacant positions of MMGS II and MMGS III Special Management Executives. Candidates who were interested in applying for this recruitment should clearly note the educational qualification requirements as well as the age eligibilities. All the aspirants should kindly note that to apply for the recruitment, one should fill the online application form which was now available at sbi.co.in/careers. The link for filling the SBI SME online application forms is also provided below. The recruitment for MMGS II & III SME (Banking) would be done based on an Online Objective Test. Shortlisted candidates would have to also appear for a group exercise or interview for final selection. The probation period for both these Grade II and III posts will be 1 year from date of joining. So, after the successful completion of this period, the officers will be settled in respective grades and will be governed by existing specialist cadre placement and promotion policy. The officers can opt for conversion to General Cadre after completion of five years including probation period. In the case of conversion to General Cadre, the seniority of the officers in specialist cadre will be protected for all future promotion. Before applying for the SBI SME Recruitment 2019, the aspirants must read the eligibility criteria thoroughly to know whether they are eligible or not for the post. The Eligibility criteria of SBI SME MMGS Recruitment 2019 specifies the age limit, educational qualification, and nationality of the candidates. Without satisfying the eligibility conditions, one should not apply for SBI SME Jobs. If in case you applied for this Special Management Executives recruitment without satisfying the eligibility conditions, then the officials will not accept your application form. So, apply for this SBI Bank exam only if you found you are eligible for the notification. Let’s have a look at the below sections for age limit and educational qualification details. Candidates must have completed 2 years full time CA/ ICWA/ ACS/ MBA (Finance) or equivalent post graduation degree in Finance from a recognized Institute or approved by AICTE. Postulants applying for SME MMGS III post must have a minimum of 5 years post qualification experience as an Executive in Supervisory/ Management role in a schedule Commercial Bank/ Associate or a public sector Financial Institution/ Company or listed Financial Institution. A minimum of 2 years post qualification experience as an executive in Supervisory or Management role is required for SME MMGS II post. Aspirants having experience in processing of credit proposals are preferred. The age limit for SBI Special Management Executive Recruitment 2019 for both MMGS II and III scales is as follows. Age of these candidates should be as on 31st March 2019. However, age relaxations are applicable for all reserved categories as per the rules of State Bank of India. PWD (SC/ ST) – 15 years. For PWD (OBC) – 13 years. PWD (General) – 10 years. Candidates applying for State Bank of India SME Recruitment 2019 should be aware of some details like Selection Process, Application fee, SBI Bank Exam date, etc. Also, before applying one should know the details of SBI SME Job description and Payscale. Here we are providing all these details for the sake of eligible candidates. You can also refer the official site, i.e., www.sbi.co.in for more details regarding the SBI SME Recruitment 2019. State Bank of India will shortlist the candidates based on their performance in the following rounds. Group Exercise and/ or Interview. Closing date for submission of SBI SME Online Application: Notify Soon. Fee payment for SBI Special Management Executive jobs: Update Later. Written exam date: Intimate Later. Candidates applying for SBI Special Management Executive Recruitment 2019 must pay the application fee through Challan in any branch of State Bank of India or Net Banking. The application fee for various categories is mentioned below. For General and other Candidates: Rs. 600/- (with Intimation charges). For SC/ ST/ PWD categories: Rs. 100/- (Intimation Charges only). Candidates selected as a Special Management Executives in Central Recruitment and Management Department will get a pay scale as follows. Special Management Executive (MMGS III) – Rs. 31,705 to Rs. 45,950/-. For Special Management Executive Banking (MMGS II) – Rs. 42,020 to Rs. 51,490/-. Ahmedabad, Asansol, Baroda, Bhubaneswar, Bangalore, Bhopal, Chennai, Chandigarh, Delhi, Guwahati, Hyderabad, Indore, Jammu, Jaipur, Kolkata, Kochi, Ludhiana, Lucknow, Madurai, Mumbai, Nagpur, Patna, Ranchi, Sambalpur, Trivandrum, Vijayawada, and Varanasi are the different pre-decided exam centers for SBI SME Recruitment 2019. However, the bank reserves the right to add or remove any test center and allot the candidate to any examination center other than the one he/ she has opted for. The Online Application link of SBI SME Notification 2019 is available on our site attached below. So, the individuals should fill the application form between available dates only. Kindly open the SBI Online application of the relevant post from the given link and also submit the application before the deadline. Here I have provided the step by step procedure below to apply online for the State Bank of India SME Jobs. Also, we suggest all the candidates check the last date and apply for this SBI SME MMGS Recruitment 2019 as soon as possible. How to Apply online for SBI SME Recruitment 2019? On the home page, search for the careers tab. Check for the SBI SME Notification 2019 Link. Complete the basic registration process. Then pay the requisite fee as per your category through Net Banking or using challan form in any of the SBI Bank branches. Now upload scanned documents such as your recent photograph, signature, certificates, etc. as per the given format. Verify your details once again and then click on submit button. The candidates can download their SBI SME Call letter and an “acquaint yourself” booklet by entering their basic details such as registration number, password, and date of birth from the Bank’s official website bank.sbi/careers/ or www.sbi.co.in/careers. Aspirants should remember that there is no hard copy of the call letters will be sent to you by post. So, one should download it before the last date. You can also get SBI Special Management Executive syllabus and Previous Papers from the other articles of our site. So, stay tuned with our www.ibpsonline.co.in site for more details regarding SBI SME Recruitment 2019. The direct link to download the SBI Special Management Executive Notification 2019 is provided below. So, download the notification and apply for this before the deadline.